Experience the cultural highlights of Sri Lanka and combine it with a week snorkelling and relaxing in the Maldives. 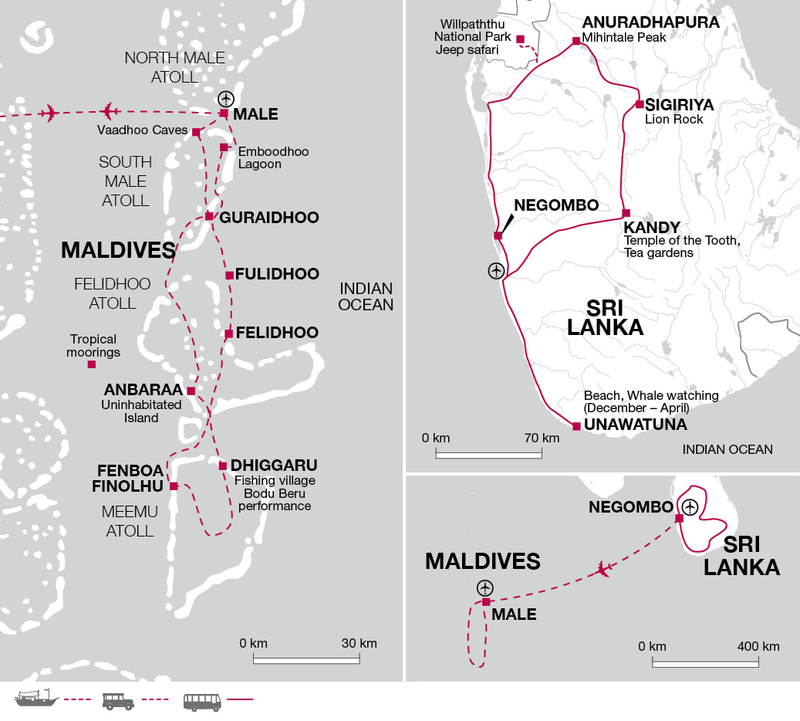 Spending a week in each, this trip gives a flavour of Sri Lanka's culture, wildlife and history as well as cruising remote atolls through turquoise waters in the Maldives. After breakfast this morning we drive to Colombo Airport where we take the short flight to Male, the capital of the Maldives. After meeting up with our local guide and the rest of the group we walk to our hotel close to the harbour in Male. The circumference of the island is little more than 5 kilometers so it's very easy to explore on foot. After freshening up at the hotel we will walk down to the Mosque, to the fish market and along the waters edge to watch the ferries coming and going. This morning we walk to the waterfront to meet our moored dhoni and crew. 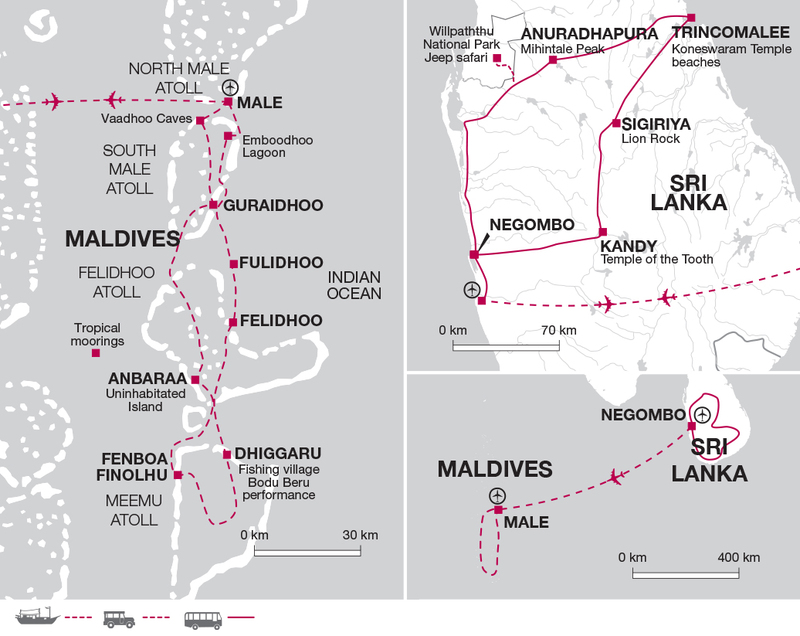 We take our breakfast on the boat and then begin cruising south for two to three hours, passing through the Vaadhoo Canal to the South Male Atoll - a smaller and quieter neighbour to the more developed North Male Atoll. Here, many of the islands are inhabited simply by vegetation and white sand, surrounded by clear turquoise water and reef. Heading further south we cruise to the Vavuu Atoll, where we spend time exploring the uninhabited and picturesque islands of Kudiboli and Kuda Anbaraa. When exploring this and other islands in the itinerary, it isn't necessary to bring special footwear. Most customers seem to manage well in flip-flops, and these have the obvious advantage of being quick to get on and off - ideal for walking through sand. Our afternoon is spent snorkelling or relaxing on board. Over the course of the week, underwater fauna we are likely to see include green turtles, reef sharks and gigantic manta rays, as well as smaller sting rays and eagle rays. At each stop, we will also swim among a rainbow of small, colourful fish, including the famous Clown Fish. Our knowledgeable local guide will be able to help identify many of the underwater species that we come across. Today, and each day, afternoon tea with freshly baked cake will be served by our talented chef. Every meal is included on the dhoni . Menus are likely to include freshly-caught fish each day, as well curries and pasta. Drinking water, tea and coffee are readily available, with alcoholic and soft drinks available for purchase on-board. US Dollars are accepted on the Dhoni and you can pay your bill for drinks at the end of your cruise. Our cabins are compact, but with plenty of room for two people and luggage. However, many customers choose to enjoy the tranquillity of sleeping under the stars on deck for at least some of the nights. Today we sail south for a further two to three hours, crossing to Meemu Atoll - home to one of the longest stretches of reef in the Maldives. On this or other crossings, we may be lucky enough to be chased by spinner dolphins, who like jumping in our wake. We are also likely to see flying fish, sometimes leaping right over the deck of our dhoni. Meemu Atoll is made up of 34 islands, of which 25 are uninhabited. Some of the inhabited ones grow yams, and all of them are largely dependent on fishing. Here more than anywhere, we are likely to experience the true Maldivian way of life. Shortly after entering the atoll, we arrive at Fenboa Finolhu - another beautiful uninhabited island where we aim to base ourselves for the night. We will have plenty of time to enjoy the white-sand beach and to snorkel on the reef. This evening, we can look forward to a barbeque beach banquet in an idyllic spot on the island, laid on by the dhoni crew. After a relaxed start, we head east to the inhabited island of Dhiggaru. Here, we drop our anchor by a particularly good snorkelling reef. Later in the afternoon, when it has cooled down a bit, we plan to go ashore to meet the island's inhabitants. We may be struck by the traditional, yet relaxed, way of life in the island's lively village. Very few tourist groups visit and we must remember to dress and act respectfully, removing our shoes when visiting a house or a mosque. In the evening, we hope to be invited to a performance of Bodu Beru (Big Drum) - the traditional folk music of the country. Today, we head back to Felidhoo Atoll and its administrative centre, Felidhoo. With a population of about 400, this is the least populated of all the country's administrative centres. Again, we take time to visit the village and have the opportunity to enjoy another Bodu Beru performance. By now, we are likely to be feeling completely relaxed, as our routine of reading, sunbathing and napping between island stops and snorkelling spots has become second nature. With a subtly different name to our previous day's stop-off, we break today's journey with a visit to Fulidhoo Island. Once again, we meet the locals and gain more of an appreciation of their life in this tropical paradise. After a further visit to the island of Hulhidhoo, we anchor by a large reef, where we can spend time snorkelling. Our last full day on the boat sees us cruising back towards Male. We take the opportunity for some final snorkelling and swimming, before enjoying a farewell meal with our boat crew. Our tour ends this morning after breakfast. Once we have said our goodbyes to the crew, we disembark the dhoni and are transferred to Male International Airport. Sri Lanka: Select your clothes carefully, bearing in mind that the climate is tropical and that upland areas are cooler and more temperate. Lightweight rainwear is also essential, and warmer clothing for the highland walks and chilly night temperatures in the mountains. When visiting religious sites you will need to dress respectfully by covering you knees and shoulders, plus taking off your shoes and hats. You may like to wear socks for temple visits as the ground can get very hot and burn the soles of your feet. You will need to bring long trousers, or buy a sarong locally. Maldives: Only lightweight clothing is needed. Local people in Male and in villages on the islands find western styles of dress extremely offensive. Brief shorts, tight fitting clothing etc. should be avoided by both men and women. A sarong and something to cover the head (for women) is recommended. Don't forget swimming gear and clothes to protect you from the sun including a wide brimmed hat. You may consider wearing a Tshirt whilst snorkelling to avoid bad sunburn on the back and shoulders. One main piece of baggage and a daypack. We recommend a soft bag such as a rucksack or holdall as whilst on the Dhoni Cruise your luggage needs to fit underneath your bed in the cabin. Remember, hotel porters are not always available, so don't overload yourself. Accordingly, you should allow £50 for tipping (£25 in Sri Lanka and £25 in the Maldives). Your tour leader will account to you for any organised tipping. In the Maldives we work with a local operator who owns a number of different Dhonis; all of which are different sizes with different layouts. The boats we are most likely to be using are are 6-10 berth Dhonis and we will either use one or two boats depending on the group size and make-up. All Dhonis that we use are fitted with diesel engines, which are used most of the time when we are travelling. Some of the boats still have sails but these are used very infrequently. All Dhonis are inspected annually in order to retain their license. They carry enough lifejackets for all clients and crew plus buoyancy aids and a dinghy with small outboard engine. All boats have a CB radio, and for most of the voyage the boat is in mobile phone range of the islands. Full fire fighting equipment is also carried on every boat. There will be a minimum of 4 or 5 crew on board including the captain and cook - depending on the number of people on the boat. Most of the cabins offer couchette accommodation on a twin share basis with all bedding provided. The cabins are small and simple but adequate for sleeping and changing. In most of the cabins there will be bunk beds and so the person on the top will need to be prepared to climb up to their bed. Facilities are shared, and each boat has 3 or 4 toilets and 2 or 3 showers on board. There are plugs available in each cabin with electricty available when the boats generator is running (when the boat is moving or the crew are cooking meals) so it is possible to charge cameras and phones during the tour. Good quality snorkelling equipment including mask, snorkel, flippers and swim noodles are provided (we will ask for your shoe/flipper size before you travel). You are free to bring your own equipment should you wish. No scuba diving equipment is carried on board. All meals and a bottle of drinking water each day are provided on board the Dhonis. There is a bar for any additional soft and alcoholic drinks you may wish to buy, a dining area and a sundeck to relax and sunbathe throughout the day. It should be noted that it is not permitted for tourists to bring alcohol in to the country and it will be confiscated at the airport if you attempt to do so. People requiring a gluten free diet may struggle a little in the Maldives. Breakfasts are often mashuni - a tuna and coconut combination which is served with roti style bread or a more western start to the day with eggs and toast. Most lunches and dinners will have a pasta element and during the afternoons the boat crew will often bake a cake. Whilst plenty of fresh veg, meat and fruit is also provided if you do follow a gluten free diet you may wish to take some snacks with you to supplement the diet on board the dhoni. Maldives: Citizens of the UK, Australia, New Zealand, US and Canada are given a free 30 day permit on arrival. Other nationalities should consult the relevant consulate. Sri Lanka: All foreign nationals who intend to visit Sri Lanka for a short stay of up to six months must apply for travel authorization online prior to travel to the country. If your return flight requires you to transit in Sri Lanka then you will not be required to obtain a second Sri Lankan visa if your transit time is less than 48hrs. To obtain an Electronic Travel Authorisation (ETA) you must visit http://www.eta.gov.lk to apply for it prior to travel. It is strongly recommended that you print and bring a copy of the ETA approval notice with you. The Sri Lankan authorities require that your passport must be valid for at least 6 months after departure from Sri Lanka. This tour provides the opportunity to see the fascinating highlights of Sri Lanka before spending a week cruising around the idyllic Maldives on a traditional Dhoni. You'll see wildlife, ancient ruins and bustling local life before a relaxing week of snorkelling, swimming and visiting traditional fishing villages to meet the locals.